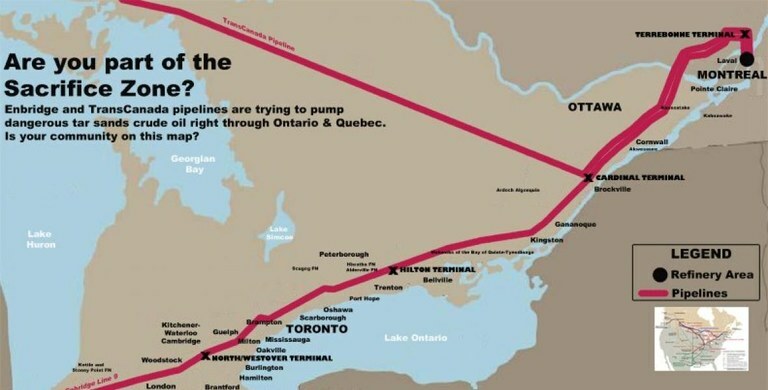 Speaking about line 9, Kingston has added its name to a growing list of cities with concerns over the safety of the pipeline reversal project. if line 9 is approved it will allow for a toxic tar sands slurry to cross river flowing into lakes Erie and Ontario in aging infrastructure. Getting back to the pegasus pipeline rupture, tarsandsblockade.org has been reporting on this and have been constantly harassed by local police officers who are taking orders from exxon to keep journalists away. Residents had to cancel interviews with the activists as they were too sick to meet up, suffering from the same ailments as those near the 2010 pipeline burst in Kalamazoo michigan. check out the linked video from a fly over of the oil disaster. Staying with tar sands, respected scientist dr. David Schindler has been working in the Athabasca river recently and has reported (as locals and enviros have been saying for years) that many fish he is finding are malformed or have open sores on them. While oil sands operations have long been blamed for the malformations, Schindler has observed that the fish in the Athabasca are similarly toxified as those found in both the gulf of mexico a little after a year following the deep water drilling disaster, and in alaska near the site of the 1989 exxon valdez tanker wreck. in Alaska, residents are still waiting for compensation and still complain of lasting health and environmental problems. Dr. Schindler also notes that continued research is necessary and that the Harper government's decision to close the experimental lakes area and save 2$ million/year is a dumb move. Keeping with contamination, we talk about the CBAN day of action on april 9th to show discontent in the pending approval of GM alfalfa in eastern ontario. the national farmers union called the DOA saying that contamination of non-GM alfalfa is assured as alfalfa is a perennial airborne pollinator, and GM alfalfa will further speed the spread of pesticide resistant plants. Now from a threat from east to west, to one moving west to east, a natural threat that is usually kept in check by cold winters is destined to destroy all the forests of canada. The mountain pine beetle has been raging out of control with less frigid winters being caused by climate change in the northern BC, and scientists say that it is only a matter of time before the beetle fully clears the rockies and makes its way east. A couple pieces of Indigenous sovereignty - first up is a video from the Algonquins of Barriere Lake and Barriere Lake Solidarity, which has really good audio, and is really effective in its breveity. Second is a note from the Chief of Akwesasne who is saying a recent study released by the macdonald-laurier institute, which looks into tobacco trade in the border regions in Akwesasne territory, is biased in its conclusions. The researchers did not interview members of the indigenous community. A piece of spoken work is up next: from upworthy.com - Dear Straight People: We need to talk. Then a report from the Spot Collective in Kitchener, who joined up with others to help give potential foster parents the full disclosure on CAS - a for profit organisation with little government oversight. Potentials were also treated to a friendly picket on the outside of the recruiting night and given info about the impact CAS has on families and some problems known to exist in the organisation. To York U in Tdot, where undergraduate students passed a motion favouring divestment from companies profiting from illegal occupation and expropriation of Palestianian land. We then note the actions of anarchists and other anti-fascists in a Cretian port town, who confronted then fought members of the neo-nazi group golden dawn and threw their candidate into the sea after the fascists assaulted several island dwellers. in this week's "if ya can't beat them, reform them" we once again we point to the change.org petition calling for the cancellation of #TowesTV and the show Border Security. moving into a segment on the battle against gentrification and poverty and for houses for all, we first read up onHomeless Dave from Vancouver who has lost 1lbs a day for the past two weeks as he is hunger striking until mayor gregor and the gentrification possé creating social housing, social spaces, and make the DTES a social justice zone. we then go to OCAP's sitting battle at Toronto city council to get more shelter space - they won, yet the fight continues until there are homes for all! Staying in Toronto, Dan reads No One is Illegal's May Day call out which is looking to build on recent victories and hard fought battles and campaigns and continue to construct a solidarity city! Stop the Cuts, Stop the Raids, Stop the Detentions, Stop the Deportations! Freedom to Move, Freedom to Stay, Freedom to Return! Status for all, Access Without Fear! A read of a piece from socialist.ca on the ongoing campaign around the Iraq war resisters, a decade into the war in Iraq. Resisters are still being deported by Jason Kenney and the Harper government despite the one sided court martial system the conscientiousobjectors face once in the US. Before getting to the last two pieces we play the Kalan Wi song "This is Our Song", which was dedicated to the Nishyu walkers by the west coast world music group. To close out, Dan reads 2 important pieces. first up: 10 Reasons not to give your itinerary to the police, posted up on quebecprotest.com which gives an argument to counter bylaw P-6 in Montreal which has been used to stifle dissent in quebec's largest city. Protest is not a negotiation, it is a responsibility! Secondly is a read of the 1988 Crypto Anarchist Manifesto which prophesized the power of an anonymous internet, with the an idea that encryption will allow freedom (bring on the complexities).